In this passage we have the father interceding for the child who is tormented by an evil spirit which is both deaf and dumb. The person who is desperately in need of the healing is unable to ask for the healing. 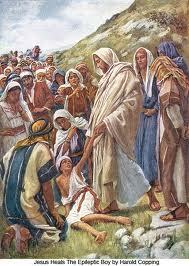 He is so possessed by the evil spirit that he does not even know that he needs the healing. Also recognize that demon that has taken possession of the child is deaf and dumb as a result he cannot hear the Word that can deliver him nor speak the words requesting the deliverance. This is what Satan does. His aim is to destroy both the soul and body and to give no occasion for that person to hear the Gospel of Christ which will deliver. But praise be to the Lord that He has put in an intercessor for this boy. The father is so beset with misery with the condition of son and desperately tries to find a cure for the boy. In his searchings he hears of works and miracles of Jesus and takes it upon himself to go to Jesus for the deliverance of his son. “Who knows”, he thinks to himself, “this may be the means for my son to be healed”. And so he makes his journey to the Lord Jesus. Today, you may be in the same position as this father. You may have a son or daughter, a spouse or parent, or loved one who is in desperate condition and needs the deliverance of the Savior. He only is able to save and those who come to Him, He is able to save to the uttermost. You may be like this father and have tried every other means to redeem your loved one but nothing was of any help, there was no deliverance, no salvation. Remember Christ is the Savior and he that cometh to Him for help, He will in no wise cast off. That is our Lord, that is His nature. His loving kindness is everlasting. God has put you in the position to ask for this loved one. Do not despair, but take your loved one to the Lord and He will surely deliver. That is His promise and He is a faithful God.